Comptrollers representing State and Central agricultural universities were asked to play a proactive and responsible role so that projects and educational schemes proposed by the Indian Council of Agricultural Research (ICAR) could be smoothly implemented in the institutes. 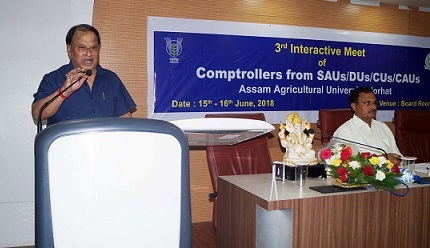 Addressing the ICAR’s third interaction meet of comptrollers from SAUs, DUs, CUs and CAUs at the Assam Agricultural University, Jorhat on Saturday, Vice Chancellor KM Bujarbaruah said that the comptrollers should ensure that every paisa was judiciously utilized as funds were not easy to come by. “Having been closely associated with ICAR, I have complete knowledge about how the education division of ICAR functions, the sincerity, integrity and effort with which they formulate the various educational policies, projects and fellowship schemes should be reflected In terms of how we implement these programmes. The funds should be utilized judiciously and timely and the comptrollers are responsible for this,” he said. Praising the AAU comptroller DR Kaman and his team for being very proactive, hardworking and diligent, Bujarbaruah further said that it was seen at times that comptrollers were very negative, raising objections at every step, due to which there was no fruitful outcome of the plans and projects floated by ICAR for the agricultural institutes in the country. Bujarbaruah stressed on comptrollers giving proper advice so that misappropriation and malpractices do not occur and at the same time ensure financial propriety and economy. The VC pointed out that sometimes there was conflict between the Centre’s General Fund Rules 2017 and the State Finance Department which was evident especially in payment of TA in which there was a clash in which Central entitlement differed from State’s. These and some other things should be resolved and clear directions given,” he said. Bujarbaruah further said that according to the latest GRF, comptrollers should find out how internal revenue could be generated. NS Rathore, DDG, Agricultural Education, ICAR, New Delhi in his detailed speech said that comptrollers had to follow three Ts – – timely action, trouble free approach and transparency and to put into place the right type of mechanism. Regarding transparency and the RTIs being used as weapons, Rathore said that this often led to comptrollers being blamed and a sense of isolation, due to which they often did not feel like working. He said that governance at the comptroller’s level entailed accountability and responsibility and was a challenging job. He also asked them to generate funds. He also spoke on transactions being digitized and the new Public Finance Management System and the stringent monitoring from top on all expenditures. Rathore further informed that out of the 70 agricultural universities, 14 had not filed for accreditation by March, 2018 and were not entailed to funds in various categories and for student enrollment from among those who passed the national level exam. “Accreditation is mandatory for these,” he said. The list of ranking of the universities would also be published soon, he said. Rathore further informed that the scholarship money had been enhanced and that enhancement of allowance of JRFs and SRFs was also on the cards. He enumerated ICAR’s educational schemes and projects for the universities and the scholarships and fellowships which can be availed by students including foreign students. 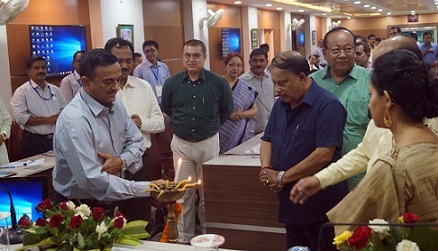 PS Pandey, ADG, (EP and HS), ICAR in his special address spoke on the role of ICAR’s Agricultural Education Division and enlightened the gathering of more than ninety comptrollers, nodal and other officials from across the country on the Public Finance Management System.